It’s fall in Flagstaff, Arizona and that means cool 20°F (-7°C) nights and bone-chilling wind. Lots of wind. Battling the elements, including wind, is one of the challenges for all-season hammock camping. Wind can strip heat away from a hammock through convection. This time of year, it’s a good idea to pull out the big tarps an learn different ways to pitch them to maximize coverage to block the wind (or snow, or rain), and create a cradle of dead air space that can keep you warmer an more comfortable. There are dozens of ways to pitch a basic tarp, but not all of these methods work well with hammocks. Over the next few weeks I will post a few techniques on how to take a tarp and mix in some origami magic to maximize coverage over a hammock, depending on the conditions. 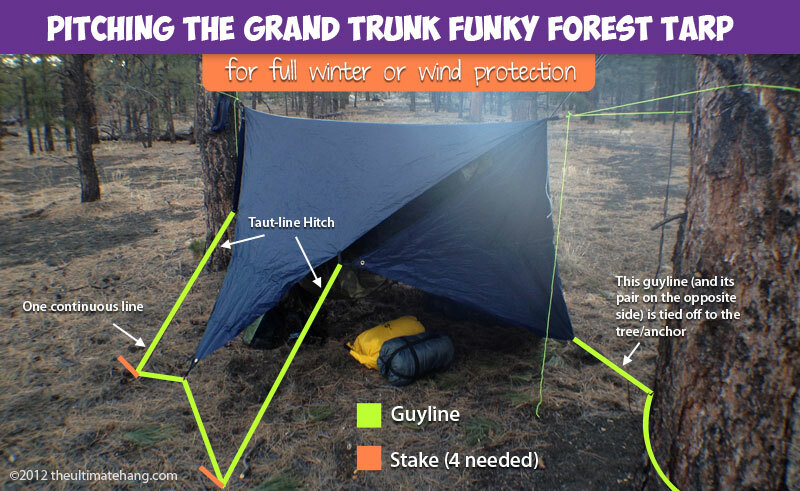 Today I’m going to show a few photos of the Grand Trunk Funky Forest Tarp. First of all, this tarp is simply huge! The ridgeline is 15 ft (4.5 m) long and there are 12 perimeter tie-outs. The edges are 11 ft (3.3 m) long. I found that the 15 ft (4.5 m) ridgeline was too long for my typical hang distance, so tying off from a different pair if tie-outs was a natural choice. With guylines, this tarp weighs 21.65 oz (614 g). 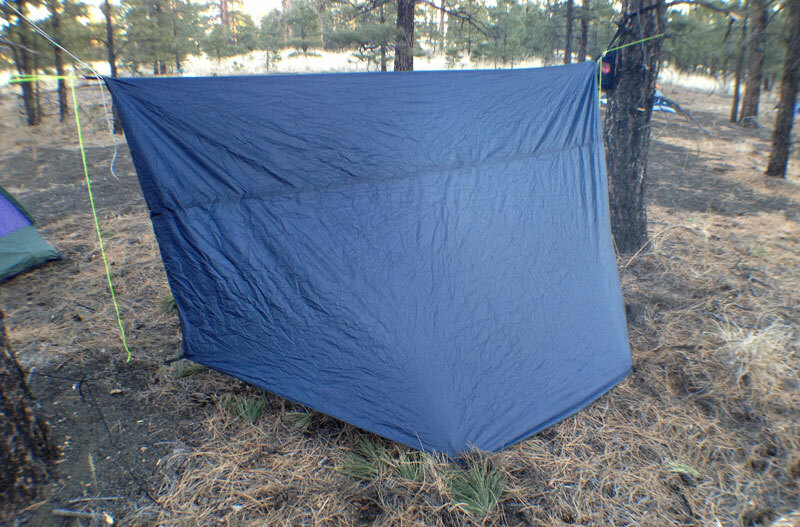 This tarp is designed for a basic diamond pitch, but with the extra tie-outs, you can do so much more. By using any of the side tie-outs, you can set the peak or ridgeline on a different part of the tarp an pitch the tarp with peak doors and to-the-ground protection. The second photo shows the windward side. Disclosure: Grand Trunk Goods provided TheUltimateHang.com with a complementary Funky Forest Tarp to review in 2011. What is the weight on this tarp? I just put mine on the scale: 21.65 oz (614 g). I’ll append my post and add this. On the other hand, both can be used for tarp camping easily. The GT Funky Forest Tarp has multiple tie-outs, which makes it easy to apply some origami tricks to make different styles of shelters.